For many of Anglican upbringing, the cultus of the Sacred Heart of Jesus seems a rather garlicky and ethnic sort of thing – fine for Italians, Frenchmen, Spaniards, or best Irishmen, but utterly unsuited for the more sophisticated. So many of the Sacred Heart pictures are effeminate, and things like the Auto League of the Sacred Heart merely tacky. In a word, it is so very Roman, and utterly un-Anglican! While this this may be a not uncommon set of views, it is utterly incorrect. The key role of many Monarchs, presidents, and nobility in spreading the devotion through its history should end any worry about its social status; the Sacred Heart’s traditional popularity among soldiers and other occupations traditionally demanding self-sacrifice should dispel any fears regarding its masculinity. But, in truth, it actually has deep – if not immediately apparent – roots in British Christianity. Although the form in which we now have it is that delivered to St. Margaret Mary Alacoque (and notably sneered at by James Joyce in Dubliners), the roots of the Sacred Heart devotion lie as far back as the Crucifixion, and the piercing of Christ’s side by St. Longinus with the Holy Lance. Devotion to the wound in Christ’s side and the instruments of His Passion was widespread throughout Christendom, and nowhere more than in Medieval England. Closely tied to this practice was the veneration of Christ’s blood, centred at Hailes, Ashridge, and Westminster, symbolised by the Holy Grail (which vessel, however, is likelier to be found today at Valencia than Glastonbury), and memorialised by the oath “God’s Blood!” All five wounds of Christ taken together were similarly revered throughout Europe: the Jerusalem Cross was the badge of both the Crusaders and the Latin Kingdom of Jerusalem (its large central Cross represents Christ’s side/heart wound, and it remains the badge of such modern Holy Land-related bodies as the Order of the Holy Sepulchre, the Franciscan Custody of the Holy Land, and the Latin Patriarchate of Jerusalem). They made their appearance on the coat of arms of long-time English ally Portugal, were the object of a votive Mass in the Sarum Use, and were displayed on the banner of the Pilgrimage of Grace. Naturally this reverence survived the “Reformation” among the Recusants. But the Caroline Divines retained the close connection between Christ’s wounds, His Blood, and the Holy Eucharist that had characterised undivided Christendom. This is fitting, perhaps, because members of the House of Stuart would play a key if underestimated role in spreading the devotion to the Sacred Heart with which we are familiar today. That devotion itself, however, predates St. Margaret Mary Alacoque. It was in the northern Germany of the 13th century, at the Monastery of Helfta in Eisleben, that Ss. Mechtilde and Gertrude received visions of Christ wherein He revealed truths about his heart striking similar to those that the French Visitationist nun received four centuries later. It may well be that knowledge of what had been told the saintly duo influenced Luther (a local in the Eisleben area) in the design of his seal. In any case, when St. Margaret Mary began receiving her own visions of the Sacred Heart, her confessor was a young Jesuit, St. Claude de la Colombiere. Not only did he accept her revelations as authentic, he became one of their most zealous propagators. But in 1676, after only a year and a half at Paray-le-Monial, he was sent to London to act as chaplain to Maria d’Este, the young wife of the Duke of York – younger brother to the King and heir to the throne. St. Claude operated out of the Queen’s Chapel, built as a Catholic place of worship for Queen Henrietta Maria, wife of the murdered Charles I. During the two years he worked there before being driven out as a result of the Titus Oates plot, he made many coverts and spread knowledge of the Sacred Heart. In 1685, the Duke of York ascended the throne as James II. Three years later, the King was deposed alongside the first successful invasion of England by continental army since 1066. The Royal family moved to France; on March 23, 1695, Queen Maria, implored to do so by the sisters of the Visitation in Paris, formally asked Pope Innocent XII to grant that order a proper Mass and office for the Sacred Heart. This the Pontiff did, paving the way for eventual inclusion of the Feast of the Sacred Heart in the Universal Calendar. Devotion to the Sacred Heart would remain a hallmark of the Stuarts until the extinction of their male line in 1807. In the meantime, however, religious devotion of any kind waned in the Church of England over the 18th century – leading among other things, to the emergence of John Wesley (whose own heart had been “strangely warmed” at a Moravian meeting) and the Methodists. In the 19th century, the Oxford Movement arose. Of Tractarianism’s early leaders, Pusey had no interest in the Sacred Heart. Newman certainly did, as also did Faber (who used the devotion as a jumping-off point for venerating the Precious Blood), Dalgairns, and Manning. But what of those they left behind? Anglo-Catholicism parted into three currents: the Old English School of such as Percy Dearmer, which had little use for something as “Roman” as the Sacred Heart; the liberal school, inhabited by such as the authors of Lux Mundi which likewise had did not wish to be bothered; and the “Tridentine” element, which most certainly did. Around the Anglosphere, the latter built innumerable shrines to the Sacred Heart in such Anglo-Catholic bastions as Grace Church, Newark; St. Osmund, Salisbury; St. Mary, Kettlebaston; Resurrection, New York; St. John the Baptist, Timberhill; and countless others. Many of the members of the great Anglican religious orders, such as Cowley Father W.B. Obrien, were devotees of the Sacred Heart, and prayers thereto could be found in innumerable devotional manuals, such as the Anglo-Catholic Prayer Book and the St. Augustine Prayer Book. All of which brings us back to the present, and the Ordinariates. The genius of devotion to the Sacred Heart of Jesus is that it is adaptable to the piety of every people within the Universal Church. It is not merely the French, Spanish, Italians, Germans, Portuguese, Poles, Lithuanians and so on who have their own rosters of Saints and rulers devoted to the practice. Despite the (so often legitimate!) fear of Latinisation among the Eastern Rites of the Church, it has “inculturated” very well among such particular Churches as the Maronite, Chaldean, Syro-Malabar, and many others. This fact is not too surprising, given that such veneration of the Human aspect of Jesus, concentration upon His love for Mankind, and the desire to make reparation for all of the pain our sins have caused Him is (or at least, ought to be) primary in the piety of each of us. Moreover, a practice which sees as one of its chief ends the consecration of each household, diocese, and nation in the world – and, indeed, of all Humanity – to Christ should be of universal interest. Nor is it too amazing that the devotion to Christ as King of countries and individuals has flowed organically out of it. 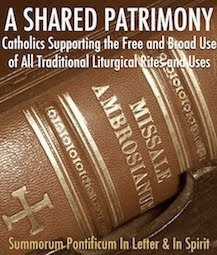 The Ordinariates have been summoned into being not merely to preserve the treasures of the Anglican Patrimony for their inheritors and the Church at large, but as a springboard for the evangelisation of the English-speaking world. To succeed in such a huge endeavour, it were well to beseech the grace and favour of the Sacred Heart of Jesus. After all, it is His triumph for which all our efforts are intended.